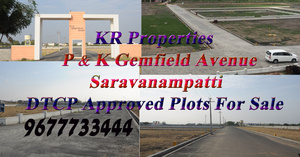 KR Properties provide DTCP Government approved Gated Community Villa Plots. Athikadavu Drinking Water as well as borewell facility is provided with over head tank. Our project is provided with 30 and 40 feet wide tar roads. A total of 157 villa plots are laid based as per vasthu complaint and developed on an area of 5 acres. Facilities of loan for purchase of land and constructing villas are provided with top bankers like BOI, LIC, HDFC, SBI, Repco, etc… Project located at Saravanampatti across periyanaickenpalayam main road.